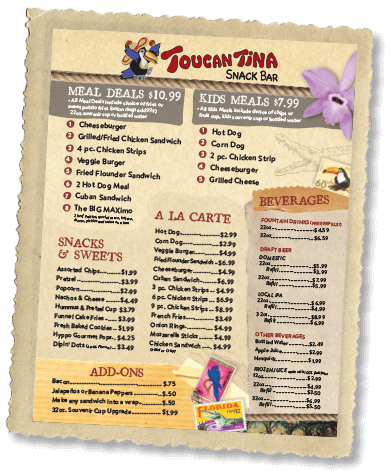 The TouCantina offers a variety of snack, dining, and beverage options to feed even the largest croc-size hunger. Cool off on those warm summer days with one of our ice-cold dessert treats or a slushy. Adults can choose from a variety of domestic beers on tap. Our entrees encompass sandwiches and quick-service items, including several delicious vegetarian options. Place your order, then have a seat in our shaded dining area which overlooks the Galapagos tortoise exhibit! Watching these gentle giants mosey about creates a unique and relaxing dining experience. Click above to enlarge the ToucanTina menu!